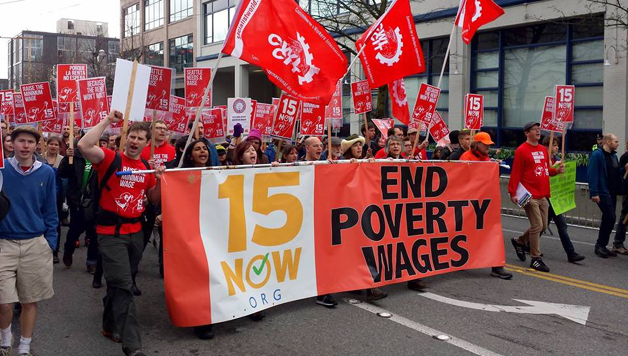 Twenty-one cities across the country fought for a $15/hour minimum wage this week, culminating in an enormous day of action on March 15. A march and rally brought out 750 supporters in Seattle, and supporters also gathered in Boston, Brooklyn, Columbus, Davis, Los Angeles, Manhattan, Minneapolis, Mobile, Spokane, Worcester, Grand Rapids, MI, Madison, Tampa, Portland (ME and OR), Tacoma, and Chicago. On Saturday March 15th, 750 protesters took to the street and made clear they will accept nothing less than a strong $15/ hr minimum wage. 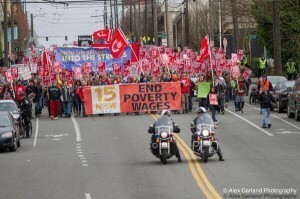 Labor activists, 15 Now volunteers and low-wage workers rallied to chants of “Tip Credit? Forget it!”, warning against a proposal full of loop-holes and exemptions, such as lower wages for tipped workers or a total compensation package which would redefine the meaning of the word “wage” and count health benefits toward a minimum wage of $15. On March 15th, 15 Now supporters and activists assembled at the Massachusetts State House in Boston MA. 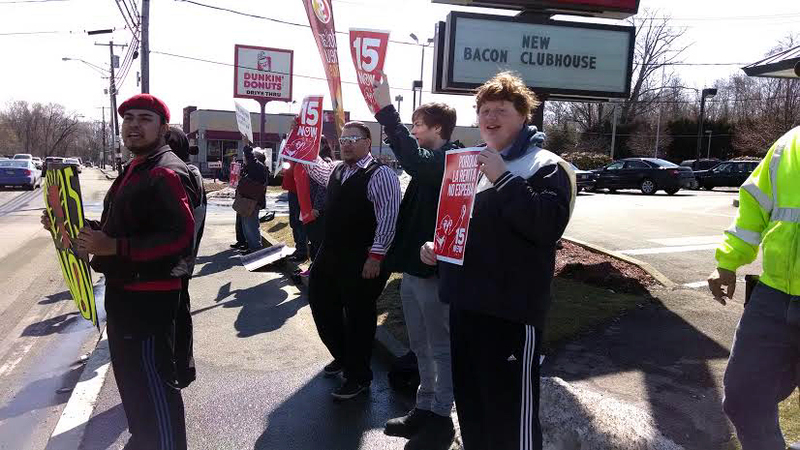 Approximately 50 people came out for the event, which was the first action of it’s kind, marching for a $15/hr minimum wage in Boston. 15 Now organizers Elan Axelbank and Toya Chester spoke on the steps of the state house about the effects of poverty wages, the actions happening across the country, and we should not settle for anything less than $15. 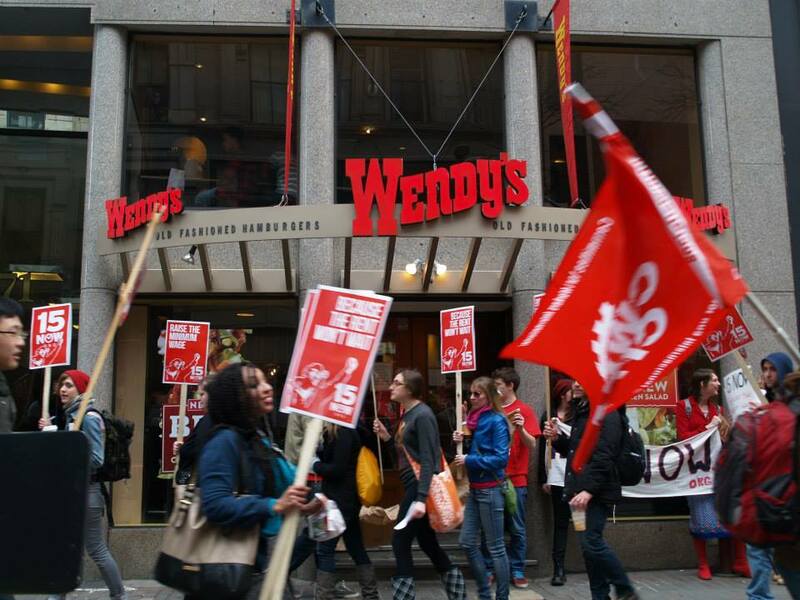 Along the march, 15 Now set up picket lines at Burger King, CVS, Wendy’s, and Subway, businesses notorious for low pay and union busting. The marched ended at Dewey Square near South Station, where 15 Now organizer Ryan Mosgrove spoke about the next steps for 15 Now New England. 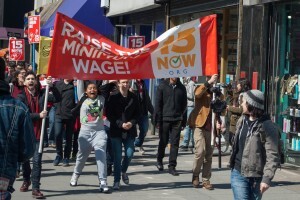 On Saturday, March 15th, dozens of activists from several different organizations gathered at 425 Fulton Ave. in Brooklyn – in front of a recently shut down business – to rally for a $15 an hour minimum wage. 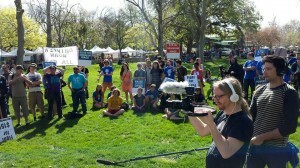 A number of organizations were represented at the rally, not only Socialist Alternative, but also Occupy Kensington, the Green Party (including their candidate for governor, Howie Hawkins), System Change Not Climate Change, Trade Justice New York Metro, as well as others. 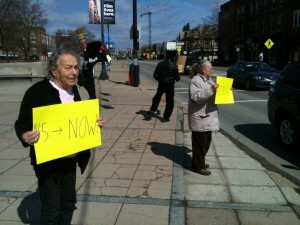 Passersby flocked to the activists, curious to learn more and to get involved in the campaign. When the march progressed down Fulton Mall, people on the streets began joining in the chants and applauding wildly. One worker, standing outside an electronics store wearing a sign promoting cheap goods, began pointing at his boss as the marchers passed, asking when he’d ever get paid $15 an hour. After marching through Fulton Mall – a street lined with low-wage paying chains stores and restaurants that feels like it could be in any godawful American suburb – a rally was held and a number of people spoke. Howie Hawkins, the Green Party Candidate for Governor, was among the speakers, publicly coming out in favor of $15 an hour minimum wage and denouncing Governor Cuomo as “Governor 1%”. 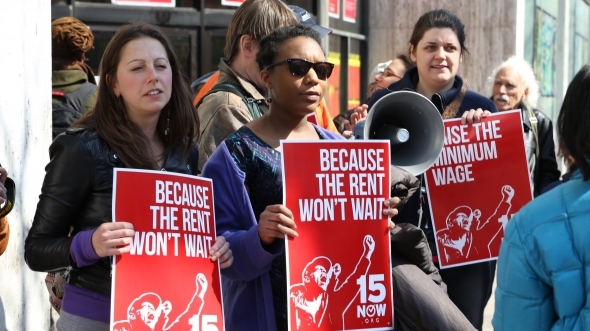 This rally and march signified the growth of the 15 Now campaign in NYC, showing that its appeal and reach is spreading beyond its introduction by Socialist Alternative to other activist groups and organizations throughout the city. 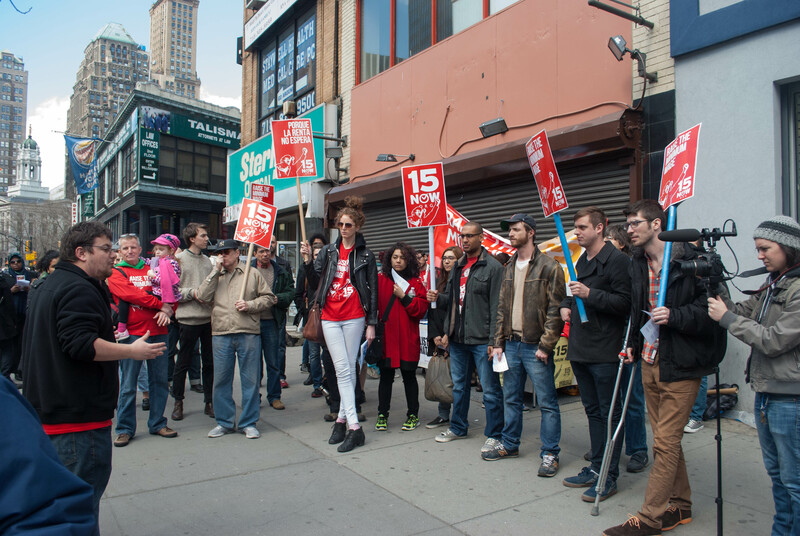 NYC is clearly ready for $15 an hour, but we need to fight to make sure it happens. 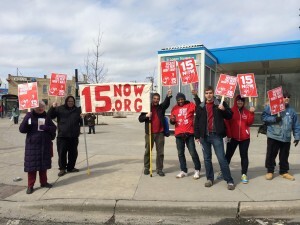 In Chicago, 15 Now supporters rallied, sang and chanted in Logan Square before marching down Milwaukee Avenue and convening a 15 Now Chicago kickoff meeting at the Logan Square Library. Few in numbers but high in spirits, the standout for a $15 minimum wage in Columbus, OH received many honks of support at a busy intersection near Ohio State University! 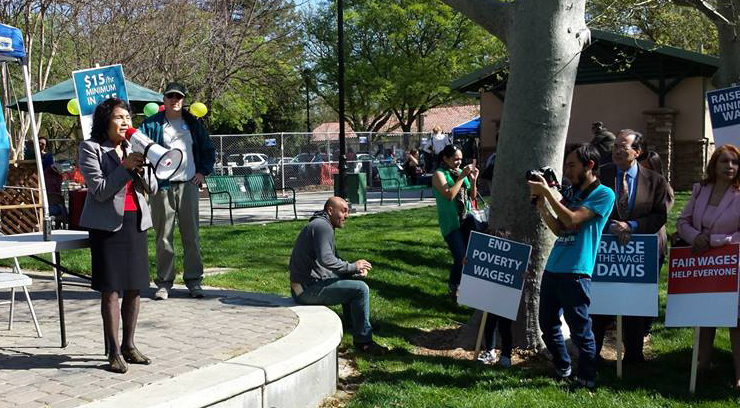 Dolores Huerta spoke along with members of the Davis community at Central Park at 11am to kick off the Raise the Wage Davis campaign. 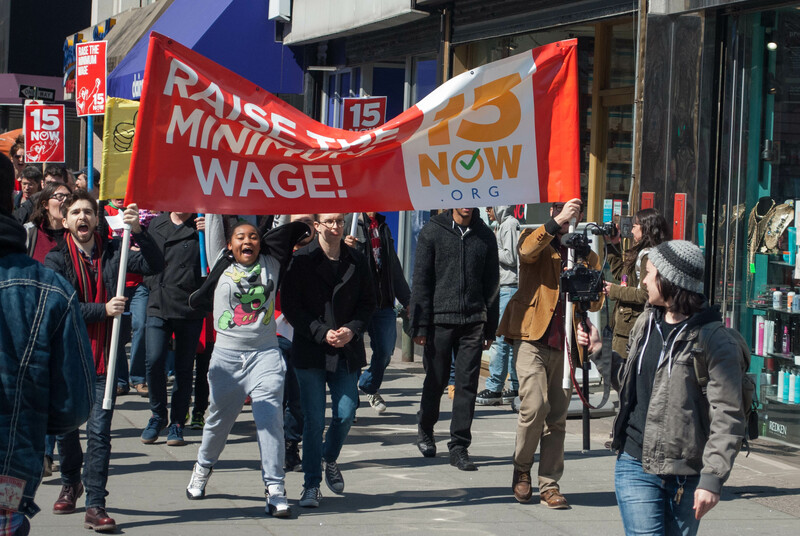 On Saturday, March 15, dozens of activists, including members of Socialist Alternative and 15 Now gathered in Historic Herald Square to rally for a $15 an hour minimum wage. Speaking in front of Macy’s Flagship 34th Street store, protesters reviled the retail giant’s low wages, and called on them to pay their workers a living wage. 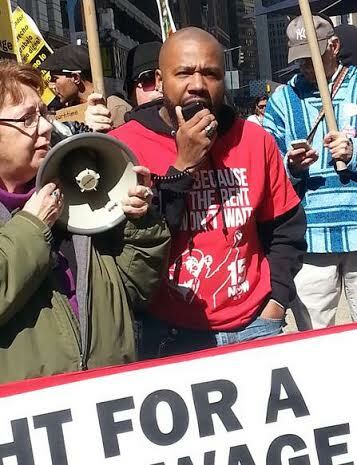 Among the diverse mix of speakers who addressed the issue was Socialist Alternative and 15 Now NYC own Eljeer Hawkins, who spoke about the fight for $15 as part of a larger workers’ struggle. After the rally, which lasted about forty minutes, protesters began their march down 34th street. Carrying a $15 Now banner and placards with “the rent won’t wait” written on them. Protesters chanted “fifteen dollars is a right/fight fight fight” as they streamed first into the Foot Locker retail chain, and then later into the H&M clothing store. 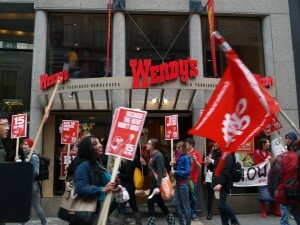 The march continued on to several other retail outlets before ending outside the McDonald’s on 30th and Broadway. Around 100 people attended a rally and meeting for 15 Now Minneapolis. There were several excellent speakers, including Josephina Catalan and other representatives from CTUL (Centro de Trabajadores Unidos en la Lucha). Great energy filled the room, especially during breakouts, where attendees worked to create concrete steps for building a movement for a $15/hour minimum wage in Minneapolis, MN. On March 8, workers, organizers, and activists held their first public action in Philadelphia demanding that city officials raise the city’s minimum wage from $7.25/ hr. to $15/ hr. The action was organized by 15 Now Philly. Coinciding with International Women’s Day, the day’s action honored the hard work and dignity of women workers struggling to raise families and pay off student debts while working low-wage service sector jobs. 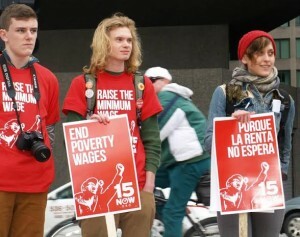 Protesters convened at 10th and Market St., carrying signs reading “The rent won’t wait,” “Raise the wage,” and “End Corporate and Politically Sponsored Poverty: Raise the Minimum Wage.” The voices of over 50 people chanted in unison: “Hold the burgers, hold the fries, we want wages supersized!”. Demonstrators then broke off into four separate groups, staging similar direct actions inside the nearby McDonalds, Burger King, Starbucks, CVS and Walgreens. 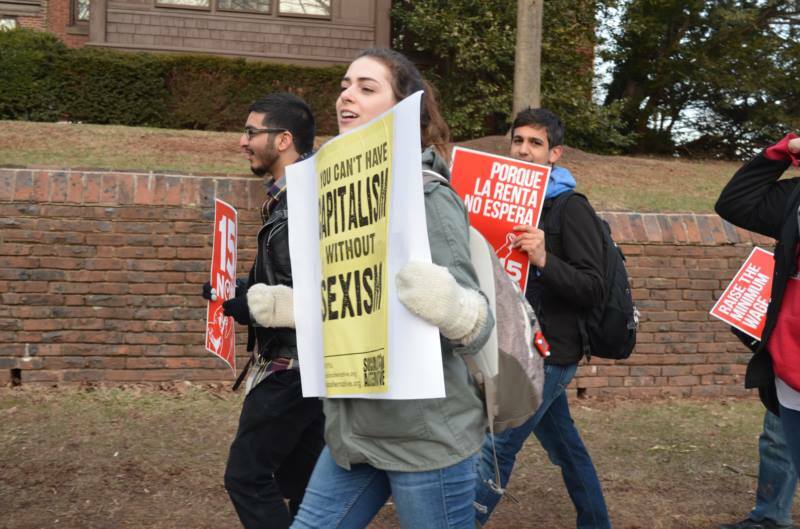 Last Saturday, students and organizers at Rutgers marched for International Women’s Day in solidarity with the 15 Now week of action. 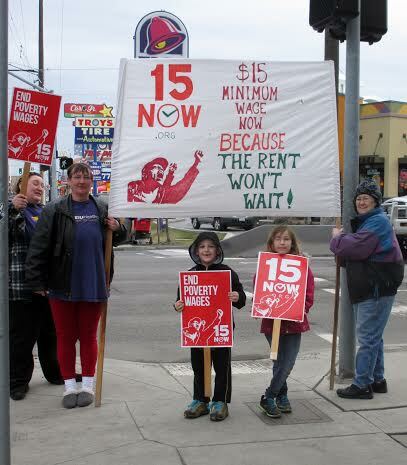 Some 30 people, representing Socialist Alternative, Occupy Spokane, SEIU 755, Peace and Justice Action League of Spokane, Green Party, Spokane Rising Tide, and YELL, marched and protested on one of Spokane’s several “fast food alleys” as part of the nationwide March for $15 on March 15th. Chanting, dancing, singing, speaking, and marching, the group hit several major low-wage, fast food employers, including Taco Bell, McDonalds, Carl Jr’s, Jack-in-the-Box, Arby’s and Domino’s. 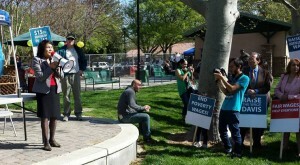 Local TV station KHQ covered the event. The public response was enthusiastic, judging honks, waves, and thumbs up. 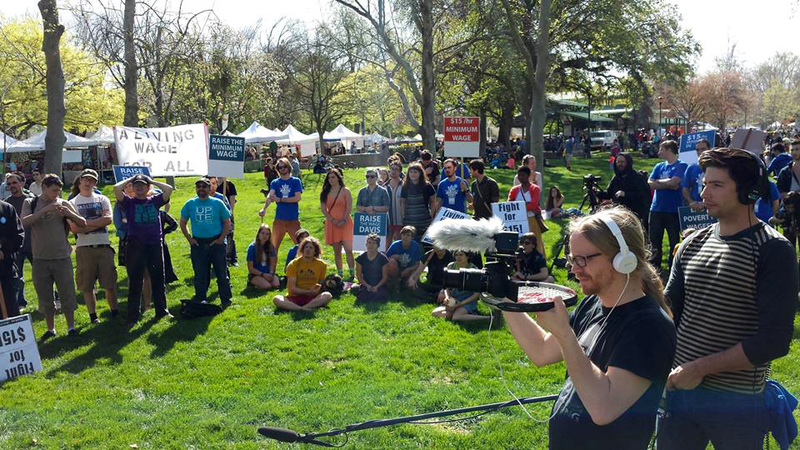 During the two hour event, speakers proclaimed the immediate need to provide workers with a living wage while denouncing the record corporate profits made on the backs of low-wage workers, mostly women. Supporters of 15 Now held public meetings to initiate a fight for $15/hr locally, connecting the struggle to the national day of action and the successes in Seattle. 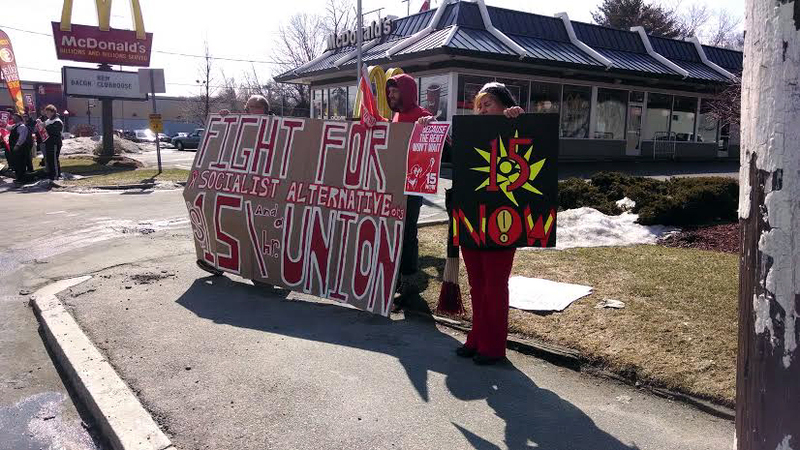 At Noon on March 15th an informational picket and stand-out gathered in front of a McDonald’s on Grafton Street in Worcester, Massachusetts as part of the national March for 15 day of action. Home-made and printed signs in English and Spanish included “Worcester Needs a Raise”, “The Rent Won’t Wait”/Porque la Renta no espera!” Progressive and Left-wing community activists, union activists, students and members of Social Alternative made up the picket line. Union members present included three members of UFCW, one Letter Carriers’ union member, one Teamster and one member of AFSCME. Earlier in the week, a Socialist Alternative member in UFCW made a presentation about “15NOW” to the Worcester Central Labor Council. There were also three students from Clark University and a student from Worcester State on the line. 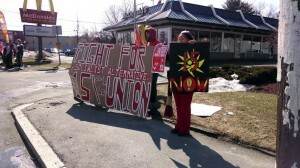 The picket/stand out lasted an hour and was followed later in the afternoon by a public meeting to introduce Worcester to the “Fight for a $15 Minimum Wage” at the main branch of the Worcester Public Library. About 15 attended the meeting, including some members of the community who were not at the earlier informational picket. Previous articleIs Sweden a Model to Follow?